Effective online presentations are critical to any organization or industry. Your success can depend on it. You might need to prepare an online sales presentation, present an idea for your team, lead a professional conference or even teach something to your audience, on a live performance. Before you do any of that, make sure you check these online presentation tips and tools. They will help you take your presentations to a whole new level. Before going into any online presentation tips or tools, you need to think of the content of what you’ll be presenting. Whether you have chosen the topic or your boss asks you to present something, you should have a clear goal. What do you want to achieve with this presentation? Do you want the attendees to learn something or to support a specific cause? Or is it a sales presentation? Think about this, if your audience left your presentation and forgot everything you said but one, what would you want the attendees to remember? That should be your focus. Then, you can build your presentation around this, with supporting information. Once you’ve defined your goal, you can research the topic and create an outline of your presentation. During your research, keep focused on your objective because, otherwise, you’ll get overwhelmed with the information overload. When creating a presentation, many people forget to consider how much time they have to present. After you write the first outline, make sure you go through it and time it. Also, check if every point you make will, in some way, contribute to your primary goal. #3 To write or not to write? There’s no need to write the entire presentation because you already know the topic and you want to sound natural. Memorizing texts can get in the way of your delivery. If you get nervous and forget something, the whole thing might go downhill from there. What can be helpful is to write your introduction and your conclusion. Still, there’s no need to memorize it, but if you practice enough, you’ll know what you want to say when it’s time. You should also write the main points you want to present, to make sure you remember them. When writing an outline, an entire presentation or even the slides, an app like Grammarly can help check your grammar and spelling. If you want another pair of eyes to have a look at your presentation, you can write and share your text on Google Docs or Evernote. When it comes to the text of your slide deck, keep it short and straightforward. Slides with a lot of writing are distracting. More than that, viewers don’t want to watch you read slides. The purpose of text in a slide deck is to help you remember your key points and keep the audience on the same page. Since we, humans, are very visual, your slides must help you make your point. If you have images or graphs that can get your message across, use them. Powerpoint is one of the most well-known applications when it comes to creating slide presentations. Unlike the other tools below, Powerpoint is not free. Since many people already have the Microsoft Office suite, it comes in handy to use PowerPoint to create slides. You can also find an online version which allows collaborations. Keynote is Apple’s presentation software, and it has a web-based version (Keynote for iCloud). You’ll need an Apple ID to sign in, which you can create for free, and it will give you access to Keynote and other apps. It’s relatively easy to use, and you can create fantastic slides. Google Slides is Google’s version of Powerpoint. If you’re already familiar with Powerpoint, it should be easy to use Google Slides. It’s a free tool, and like everything else within Google Drive, it’s great for collaborations. Prezi is also online and free. Different from all the other tools, Prezi allows the user to create dynamic presentations, with animations and motion effects. Some users get carried away and end up overusing the features, which makes the audience dizzy. But when used right, its features can help you create engaging slides. On an online presentation, the visual assets play a massive role. When it comes to the appearance of your slide deck, make sure you take your time with it to get it right. If it’s an online business presentation, your slides should follow the brand’s identity of the company. Think about the colors, fonts and overall feel of the brand and bring that to the slides. Even if you don’t have a visual identity to follow, try creating one for the slides. They should be coherent, and every slide should look as if they came out of the same presentation. The tools mentioned above, like Powerpoint and the others, all have templates that can be used on your slide presentations. Though some of them might be old-fashioned, you can choose one and improve upon it. If you want more options when it comes to templates, check out Envato’s library. They have many free resources available for download, as well as paid. Another option is Hubspot’s resource page, where you can find some presentation templates for free. If you want to create something more unique and have a bit more creative freedom, try Canva. It’s a free, web-based application that helps you create images, for presentations, social media posts and so on. You can also find some templates there for your slide deck. Keep in mind that not all of them are free. Public presentations, in general, are challenging. But, on online presentations, engaging and creating a connection with your viewers can prove to be an even more significant challenge. Even though you can’t see your audience, you can look at the camera, which already helps viewers engage with you. Instead of only showing your slide presentation, you should also be on their screen. To do so, you can use ManyCam’s feature Picture-in-Picture, available for the free and paid versions. Which means, you can choose your webcam as a video source and place it in a small square on the screen. With ManyCam, you can add multiple video sources (YouTube video – Multiple Video Sources), add images and pre-recorded videos to illustrate examples, lower thirds and much more, to help you drive engagement. Using these features can make it easier for you to keep viewers focused and interested in your online presentation. 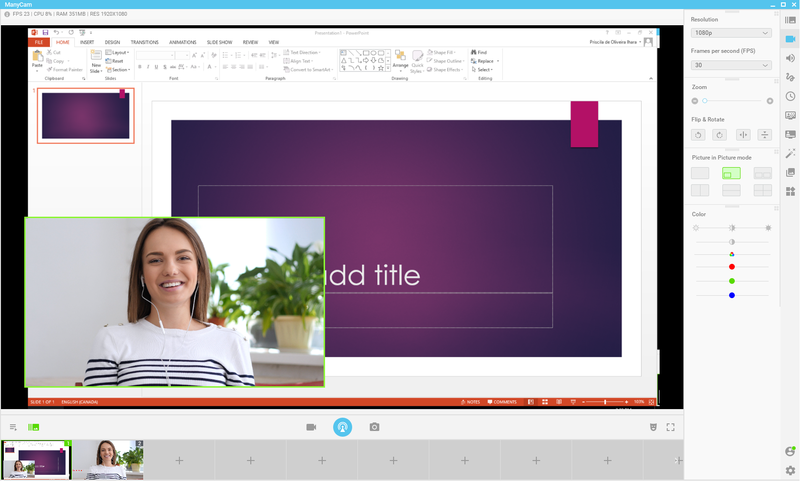 With these online presentation tips and tools, you can create dynamic presentations and achieve the results you want. A successful online presentation depends on its content, visuals, and delivery. To come up with good content, think about your goal and do the outline with it in mind. Then, use the tools mentioned above to create a beautiful and impactful presentation. Last but not least, use ManyCam to help you drive engagement and deliver an excellent presentation. Apply these online presentation tips to increase your audience’s engagement in your presentations and reach your goals! What are your favorite online presentation tips or tools?